You are here: Up-daily » Animals News » Justice For Sweet Bonita - Cracked Folks Ignited Fireworks On Dog's Mouth! 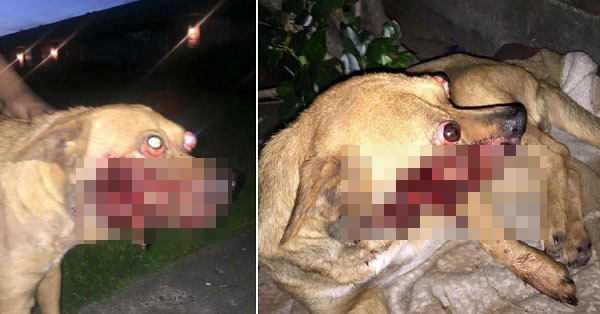 Justice For Sweet Bonita - Cracked Folks Ignited Fireworks On Dog's Mouth! Shocking news from Texas alarmed animal advocates when a gentle dog named Bonita, was discovered late evening in Houston, Texas. Bonita was wandering, injured and blood was spilling from the dog’s head. The Animal Justice League described that the dog’s injury includes part of her face is missing, both eyes are protruded out of the eye sockets and her injuries are so severe that it seems impossible to be treated. Martha Vasquez, the woman who found Bonita, alarmed all possible rescue teams to help the dog, finally local rescuers arrived, and rushed the dog to the nearest veterinarian. Upon assessment of the dog’s injury, unfortunately, it was impossible to save her, the best thing they can do is to put her to sleep to alleviate the suffering the sweet dog is experiencing. The lifeless body of Bonita was then brought to Houston Humane society, who then confirmed after an X-ray that the dog was not shot, they suspect that cracked up people had put fireworks on the poor dog’s mouth, causing her these injuries and her death. The investigation is still being conducted by the Houston Humane Society, and will further update the concerned citizens about the perpetrator whereabouts. According to the State Law of Texas, animal cruelty that involves killing, torture of animals will convict the offender is considered as a State Jail Felony, with a fine of $10,000 and/or 2 years imprisonment. Animal advocates are now aggressive towards a petition over Bonita’s death and demands justice on the sweet angel’s sufferings.